This article is about the American politician. For other persons of the same name, see Philip Graham (disambiguation). William Philip Gramm (born July 8, 1942) is an American economist and politician who represented Texas in both houses of Congress. Though he began his political career as a Democrat, Gramm switched to the Republican Party in 1983. In Congress, Gramm sponsored major acts of financial deregulation. Born in Fort Benning, Georgia, Gramm taught economics at Texas A&M University after earning a doctorate in economics from the University of Georgia. He won election to the United States House of Representatives in 1978, becoming one of the most conservative Democrats in Congress. After being thrown off the House Budget Committee, Gramm resigned from Congress, joined the Republican Party, and won a special election to fill the vacancy caused by his resignation. He won election to the United States Senate in 1984. Gramm became a member of the Senate Banking Committee in 1999, serving as chairman until 2001. He cosponsored the 1985 Gramm–Rudman–Hollings Balanced Budget Act, which sought to reduce the U.S. federal budget deficit. He also supported deregulation, sponsoring the Commodity Futures Modernization Act of 2000 and the Gramm–Leach–Bliley Act. The latter act repealed provisions of the Glass-Steagall Act which had separated banking, insurance, and brokerage activities. Gramm sought the presidential nomination in the 1996 Republican primaries but dropped out after the first set of primaries. Gramm retired from Congress in 2002. He became a lobbyist for UBS and founded a public policy and lobbying firm, Gramm Partners. He was a senior economic adviser to John McCain's 2008 presidential campaign. Gramm was born on July 8, 1942 in Fort Benning, Georgia, and grew up in nearby Columbus. Soon after his birth, Gramm's father, Kenneth Marsh Gramm, suffered a stroke and was partially paralyzed. He died when Gramm was 14. Gramm's mother, Florence (née Scroggins), worked double shifts as a nurse to supplement the veterans disability pension. Gramm attended public schools, graduated in 1961 from Georgia Military Academy (now Woodward Academy), and graduated in 1964 from the University of Georgia. He received a doctorate in economics from the University of Georgia's Terry College of Business in 1967. He then taught economics at Texas A&M University from 1967 to 1978. In addition to teaching, Gramm founded the economic consulting firm Gramm and Associates (1971–1978). In 1976, Gramm unsuccessfully challenged Texas Democratic Senator Lloyd Bentsen, in the party's senatorial primary. Then in 1978 Gramm successfully ran as a Democrat for Representative from Texas's 6th congressional district, which stretched from the Fort Worth suburbs to College Station. He was reelected to his House seat as a Democrat in 1980. Gramm's voting record was very conservative, even by Texas Democratic standards of the time. During his first four terms, he tallied an average rating of 89 from the American Conservative Union, and from 1980 to 1982 he garnered the highest rating from that body of any Democrat in the Texas delegation. In 1981, he co-sponsored the Gramm-Latta Budget which implemented President Ronald Reagan's economic program, increased military spending, cut other spending, and mandated the Economic Recovery Tax Act of 1981 (the Kemp-Roth Tax Cut). Just days after being reelected in 1982, Gramm was thrown off the House Budget Committee. In response, Gramm resigned his House seat on January 5, 1983. He then ran as a Republican for his own vacancy in a special election held on February 12, 1983, and won rather handily. One of his many special election opponents was the second-place finisher by only 115 votes in his 1978 Democratic Party primary, the then newly elected State Senator Chet Edwards of Waco, and later U.S. Representative for the 11th and the 17th congressional districts of Texas (January 3, 1991 – January 3, 2011). Another special election opponent was Texas State Representative Dan Kubiak of Rockdale, Texas. Gramm became the first Republican to represent the district since its creation in 1846. After he left the House, the seat was retained for the Republican party by Joe Barton. In 1984, Gramm was elected as a Republican to represent Texas in the U.S. Senate. He defeated Congressman Ron Paul, former gubernatorial nominee Henry Grover, Robert Mosbacher, Jr., of Houston, and several of other contenders in the primary. He then faced the Democratic nominee, State Senator Lloyd Doggett of Austin in the general election for the right to succeed retiring Republican Senator John G. Tower. Gramm polled 3,116,348 votes (58.5 percent) to Doggett's 2,207,557 (41.5 percent). Gramm was the first U.S. Senate candidate in the history of Texas to receive more than three million votes. In October 1985, Gramm, Fritz Hollings, and Warren Rudman sponsored an amendment to establish a budget deficits ceiling that would decline to zero by 1991 that was attached to a bill raising the debt limit of the federal government by more than $250 billion. The amendment was approved by a vote of 75 to 24 and was stated as a possible prelude to a balanced budget in five years without a tax increase by United States Secretary of the Treasury James Baker: "I think it's important that we recognize the Gramm-Rudman amendment is basically a process designed to give the legislative branch, and in some degree the executive branch, the political will to deal with the deficit. It means it's going to force some action. Given the political will to make the hard choices you can reach balance without having to raise taxes." 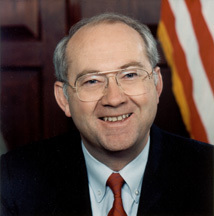 Gramm served on the Senate Budget Committee from 1989 until leaving office in 2003. Gramm and Senators Fritz Hollings and Warren Rudman devised a means of cutting the budget through across-the-board spending cuts if deficit-reduction targets were not met. They were successful in making the Gramm–Rudman–Hollings Act law, although portions were ruled unconstitutional. In the years following the passage of the Act, other sections were largely superseded by other budget-controlling mechanisms. In 1990, Gramm failed in an effort to amend the Iraq International Law Compliance Act of 1990. An earlier amendment to the act, the D'Amato Amendment, prohibited the US from selling arms or extending any sort of financial assistance to Iraq unless the President could prove Iraq was in "substantial compliance" with the provisions of a number of human rights conventions, including the Genocide Convention. After reading the D'Amato Amendment, Gramm introduced his own amendment to counter the human rights sanctions in the D'Amato Amendment. Gramm's amendment would have allowed the George Bush administration to waive the terms of the D'Amato Amendment if it found that sanctions against Iraq hurt US businesses and farms more than they hurt Iraq. In the end, the bill passed the Senate without Gramm's amendment only a week before Saddam Hussein invaded Kuwait. Gramm won his second Senate term in 1990 with a victory over Democratic State Senator and former Fort Worth Mayor Hugh Parmer. Gramm polled 3,027,680 votes (60.2 percent) to Parmer's 1,429,986 (37.4 percent), again receiving more than three million votes. Between 1999 and 2001, Gramm was the chairman of the U.S. Senate Committee on Banking, Housing, and Urban Affairs. During that time he spearheaded efforts to pass banking deregulation laws, including the landmark Gramm–Leach–Bliley Act in 1999, which removed Depression-era laws separating banking, insurance and brokerage activities. As a senator, Gramm often called for reductions in taxes and fraud in government spending. He employed his "Dickey Flatt Test" ("Is it worth taking it out of Dickey's pocket?") to determine if federal programs were worthwhile. Richard "Dickey" Flatt owns a family run printing business started by his father and mother in Mexia, Texas, and is a longtime Gramm supporter". In Gramm's eyes, Flatt embodied the burdens that a typical Texas independent small businessman faced in the realm of taxation and government spending. Gramm ran unsuccessfully for the Republican Party nomination in the 1996 presidential election, for which he had raised $8 million as early as July 1994. Although he began the race with a full war-chest and tied for first place with Dole in the 1995 Iowa Straw Poll, his campaign was fatally wounded when in an upset he lost the Louisiana Caucus on February 7, 1996 to Pat Buchanan (the final delegate count was 13–8). New Orleans Times Picayune political columnist Otis Pike noted the loss could be traced to the passion of the supporters for Buchanan compared to those for Gramm. "Gramm should have won the Louisiana caucuses – but didn't, because the religious right turned out to vote in larger numbers." At least part of this was because James Dobson infamously said, "I walked into that meeting fully expecting to support Phil Gramm for President. Now I don't think I'd vote for him if he was the last man standing." This poor showing in a state adjacent to Texas plus placing 5th in Iowa's caucuses resulted in Gramm's withdrawal from the contest on the Sunday before the New Hampshire primary. He threw his support to senatorial colleague Robert J. Dole of Kansas. Gramm, a proponent of free trade, also lashed out at Buchanan, arguing that Buchanan was a "protectionist". After abandoning his presidential bid, Gramm refocused on his bid for a third Senate term. He defeated Victor Morales of Dallas in November 1996 to win what would be his final term in the Senate. Gramm was one of five co-sponsors of the Commodity Futures Modernization Act of 2000. One provision of the bill is often referred to as the "Enron loophole" because some critics blame the provision for permitting the Enron scandal to occur. In 2002, Gramm left his Senate seat (effective November 30) a few weeks before the expiration of his term in hopes that his successor, fellow Republican John Cornyn, could gain seniority over other newly elected senators. However, Cornyn did not gain additional seniority due to a 1980 Rules Committee policy. Some economists state that the 1999 legislation spearheaded by Gramm and signed into law by President Clinton—the Gramm–Leach–Bliley Act—was significantly to blame for the 2007 subprime mortgage crisis and 2008 global economic crisis. The Act is most widely known for repealing portions of the Glass–Steagall Act, which had regulated the financial services industry. The Act passed the House and Senate by an overwhelming majority on November 4, 1999. Gramm responded in March 2008 to criticism of the act by stating that he saw "no evidence whatsoever" that the sub-prime mortgage crisis was caused in any way "by allowing banks and securities companies and insurance companies to compete against each other". Gramm's support was later critical in the passage of the Commodity Futures Modernization Act of 2000, which kept derivatives transactions, including those involving credit default swaps, free of government regulation. In its 2008 coverage of the financial crisis, The Washington Post named Gramm one of seven "Key Players In the Battle Over Regulating Derivatives", for having "pushed through several major bills to deregulate the banking and investment industries, including the 1999 Gramm–Leach–Bliley act that brought down the walls separating the commercial banking, investment and insurance industries". 2008 Nobel Laureate in Economics Paul Krugman, a supporter of Barack Obama and former President Bill Clinton, described Gramm during the 2008 presidential race as "the high priest of deregulation," and has listed him as the number two person responsible for the economic crisis of 2008 behind only Alan Greenspan. On October 14, 2008, CNN ranked Gramm number seven in its list of the 10 individuals most responsible for the current economic crisis. Gramm was co-chair of John McCain’s presidential campaign and his most senior economic adviser from the summer of 2007 until July 18, 2008. In a July 9, 2008 interview on McCain's economic plans, Gramm explained the nation was not in a recession, stating, "You've heard of mental depression; this is a mental recession." He added, "We have sort of become a nation of whiners, you just hear this constant whining, complaining about a loss of competitiveness, America in decline." Gramm's comments immediately became a campaign issue. McCain's opponent, Senator Barack Obama, stated, "America already has one Dr. Phil. We don't need another one when it comes to the economy. ... This economic downturn is not in your head." McCain strongly denounced Gramm's comments. On July 18, 2008 Gramm stepped down from his position with the McCain campaign. Explaining his remarks, Gramm stated that he had used the word "whiners" to describe the nation's politicians rather than the public, stating "the whiners are the leaders." In the same interview, Gramm said, "I'm not going to retract any of it. Every word I said was true." Gramm endorsed U.S. Senator Marco Rubio in the 2016 Republican presidential primary stating: "He's the best prepared on national security. He can win the general election." Upon Rubio's withdrawal from the race, Gramm endorsed his fellow Texan Ted Cruz, calling him "a fearless leader and fighter for conservatives all over the country". As of 2009, Gramm is employed by UBS AG as a vice chairman of the Investment Bank division. UBS.com states that a vice chairman of a UBS division is "...appointed to support the business in their relationships with key clients." He joined UBS in 2002 immediately after retiring from the Senate. Gramm lives in Helotes, outside San Antonio, Texas. He is married to Wendy Lee Gramm, a native of Hawaii, who is associated with George Mason University's Mercatus Center in Virginia. They are the parents of two sons: Marshall Gramm, a professor of economics at Rhodes College in Memphis, Tennessee, and Jeff Gramm, who is a money manager, author, and previously a musician in the indie pop band Aden. In 1999, after a bonfire stack collapse at Texas A&M University that resulted in 12 deaths, then-Senator Phil Gramm offered the F-16 flyover reserved for his future funeral as a US senator to be given instead to the Texas A&M community. The offer was accepted and a memorial flyover for the 12 killed was flown at a Texas A&M football game on November 26, 1999. Gramm, William P. (1974). "Laissez-Faire and the Optimum Quantity of Money". Economic Inquiry. 12 (1): 125–132. doi:10.1111/j.1465-7295.1974.tb00232.x. ^ a b c "Biographical Directory of the United States Congress". Bioguide.congress.gov. Retrieved August 9, 2009. ^ "Treasury Head Defends Plan for Ending Deficit". New York Times. October 14, 1985. ^ Power, Samantha. A Problem from Hell: America and the Age of Genocide. p. 236. Basic Books, 2002. ISBN 0-06-054164-4. ^ a b Shapiro, Walter (July 1994). "The Gramm Reaper". Esquire. ^ Leonard, Andrew (May 30, 2008). "Who let the oil market be manipulated?". Salon.com. Retrieved August 9, 2009. ^ "Senators of the United States" (PDF). Senate Historical Office. p. 81. ^ Ekelund, Robert; Thornton, Mark (September 4, 2008). "More Awful Truths About Republicans". Ludwig von Mises Institute. Retrieved September 7, 2008. ^ "McCain guru linked to subprime crisis – Lisa Lerer". Politico. Retrieved August 9, 2009. ^ "Phil Gramm: I Didn't Cause the Subprime Crisis – Capital Commerce". U.S. News & World Report. Archived from the original on April 18, 2009. Retrieved August 9, 2009. ^ Faiola, Anthony; Nakashima, Ellen; Drew, Jill (October 15, 2008). "What Went Wrong". The Washington Post. Retrieved August 9, 2009. ^ "The Crash: Risk and Regulation". The Washington Post. Retrieved August 9, 2009. ^ "Broadcast Yourself". YouTube. Retrieved August 9, 2009. ^ "Anderson Cooper 360: Blog Archive – Culprits of the Collapse – No. 7 Phil Gramm". CNN. October 14, 2008. Retrieved August 9, 2009. ^ Logged in as click here to log out (January 26, 2009). "Twenty-five people at the heart of the meltdown". The Guardian. London. Retrieved August 9, 2009. ^ "Internet poll: 25 People to Blame for the Financial Crisis". Time. August 27, 2007. Retrieved August 9, 2009. ^ "McCain's Economic Advisor". Texasobserver.org. Retrieved August 9, 2009. ^ Hill, Patrice (July 9, 2008). "Washington Times – McCain adviser talks of 'mental recession'". Washtimes.com. Retrieved August 9, 2009. ^ Associated Press (July 10, 2008). "Obama on Gramm: 'America already has one Dr. Phil'". USA Today. ^ Gray, Kathleen (July 11, 2008). "McCain rejects claim that Americans are 'whiners'". Detroit Free Press. Retrieved July 11, 2008. ^ Woellert, Lorraine (July 18, 2008). "Gramm Steps Down as McCain Co-Chair After `Whiners' Remark". Bloomberg L.P. Retrieved July 19, 2008. ^ From Dana Bash CNN (July 10, 2008). "Gramm: We need more leadership, less whining". CNN. Retrieved August 9, 2009. ^ Shear, Michael D. & Weisman, Jonathan (July 11, 2008). "Gramm Remark Adds to McCain's Difficulty Addressing the Economy". Washington Post. Retrieved July 11, 2008. ^ "Vice Chairmen of the divisions". UBS. March 26, 2009. Retrieved April 2, 2009.